Take a fully narrated 2-hour tour through Hollywood & Beverly Hills with fun, expert guides. See The Hollywood Walk of Fame, Chinese Theater, Celebrity Homes, make a stop up at the Hollywood Sign for photos, cruise through Rodeo Drive in Beverly Hills & much more. $7 discounted 4-hour valet parking available with tour purchase right in the heart of Hollywood, so you can walk the The Walk of Fame on foot before or after your tour. This tour is all the best of Los Angeles in just 2 hours. Your tour will begin and end at our office right in the heart of Hollywood. We offer $7 discounted valet parking that covers you for 4 hours with your tour purchase for as many cars as you need ($7 per car, per 4 hours). 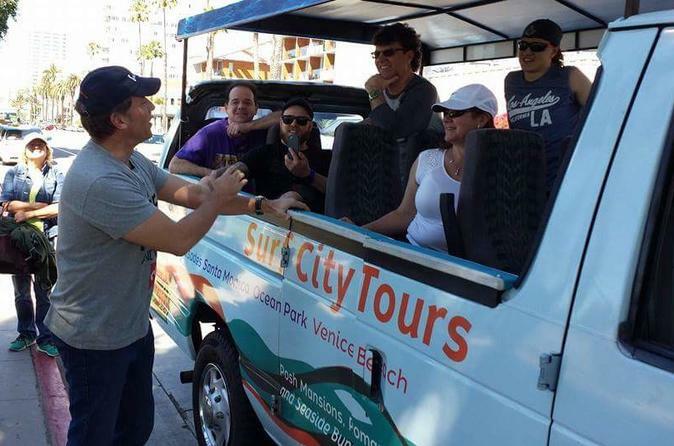 Make sure you tell them you are there for Surf City Tours when you arrive at the parking lot. Tours depart roughly every hour starting at 10:30AM, with the final tour beginning at 4:15PM. During the Summer we also offer a 5:15PM and 6:15PM tour. Each tour lasts 2 hours, after which you can be brought back to our office or dropped off right on the Hollywood Walk of Fame up the street if you'd like to explore a bit on foot or buy some souvenirs. Tours depart in clean, comfortable, open-air vehicles that make for a perfect experience when cruising through Los Angeles. Tour guides are fun, friendly and very informative. Satisfaction 100% guaranteed. If you didn't enjoy your tour tell us why and we will offer a full refund. 15-minute stop at The Hollywood Sign gives the perfect opportunity for photos; open-air vehicles also make it easy to take photos from the vehicle while on tour. Learn about the history of Los Angeles, the history of the entertainment industry here in Hollywood, see historic filming locations, night clubs, restaurants, hotels & so much more on this perfect tour of Hollywood.